What is Your Game of The Half-Year for 2014? 2014 is half-over, which means that the time is nigh to reflect on the last six months of new games. We saw some current-gen only titles drop along with a 3DS title that sought to reclaim the JRPG crown, a couple of big MMORPG releases and a game that actually made people want to buy a Wii U. As you can probably suss out from the preceding sentence, my favorite game so far this year is Mario Kart 8. 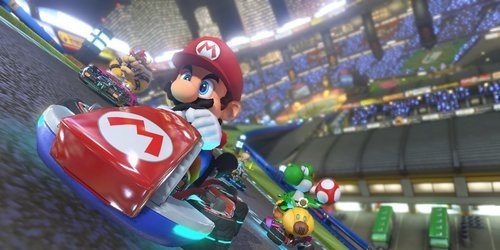 I wrote a bit about the sheer joy that playing the newest Mario Kart can bring you and I’ve yet to even dip my toes into the online mode. It even has a rather forward thinking feature for a Nintendo product in Mario Kart TV, which allows players to slice up clips of their races and upload it to YouTube, which brought us the famous Luigi Death Stare. Some might not like the serious downgrade that the Battle Mode received, but the N64 implementation of that was always the best for me and I haven’t played that mode sense. We still have six game-packed months to go and my front-runner for Game of the Year will most likely change when 2014 is done and dusted. Even so, I’d like to know what your game of the half-year is. What games do you think will knock it off in the latter half of 2014? For me it has to be Wolf Among Us. I really think Telltale is outdoing themselves with it, and I’ve been loving it. Also it’s pretty much the only game I’ve played. Watch Dogs was a big letdown for me so far this year. To be honest? My favourite has been the new Wolfenstein game. It’s nothing revolutionary in the game play department, but everything it does, it does well. The story and atmosphere had me really hooked, and I even enjoyed the Nazis, despite over-saturation in other games. So that’s top of my list for sequel wishlist at the moment. There is still plenty much in the year before I can make my definitive pick though. I did something stupid however and filled up my backlog on Steam with $550 dollars worth of games during the Summer sale. Forgive me. My favourite game up until about a month ago was actually Guild Wars 2, nothing had peaked my interest at all. That was until I got Divinity: Original Sin in the Steam sale. I wasn’t expecting too much from it but I’ve been so pleasantly surprised by it, a really cracking game.